Objectives: This study aimed at developing a model pathway to use of oral health care by homeless people based on their own perceptions and experiences with oral health care and related services in Vancouver. Methods: We applied Gelberg-Andresen’s behavioural model for vulnerable populations to predict health care use and interviewed 25 homeless adults (18 men and 7 women; age range 25–64 years) to develop a model pathway of care. Data collection and thematic analysis were carried out concurrently and iteratively to construct the pathway, which aimed at mutual decision-making and organization of the care process. Results: Thematic analysis identified 4 main themes: government-sponsored oral health programs, homeless support, oral health outreach initiatives and professional education. Conclusions: The model pathway helps to explain the factors that enable homeless people to access oral health care. It may also help dental teams foster positive care-seeking behaviour relevant to this vulnerable population so that oral disorders can be managed more sympathetically and effectively. Model pathways for care have been proposed as a helpful way to explore the effect of an array of sociocultural, behavioural and economic factors that influence the need and demand for health care and realistic patient outcomes.26,27 A model pathway aims to achieve mutual decision-making and organization of the care processes for a group of patients.28 For example, Morhardt and colleagues27 suggested a model pathway for care “to improve quality of life and daily functioning both for individuals diagnosed with dementia and for their families or other caregivers” (p.?333). A?model pathway to oral health care could enable dental teams to work proactively with homeless people toward an optimal oral health status. We selected a purposive sample of people over 19 years of age and homeless, as defined by the Canadian Observatory on Homelessness: people who are extremely poor and are living on streets, living temporarily in emergency shelters or hostels, living temporarily with friends or family or who are at risk of homelessness.1 Potential participants also had to be fluent in English, coherent, cognitively alert and willing to participate in personal interviews. Potential participants were recruited from 2?homeless shelters and 1 outreach centre with the help of the staff of the Lookout Emergency Aid Society in Vancouver, which offers emergency housing but no emergency medical or dental care. After the participants received information about the purpose, methods and expectations of the study and provided written consent, they were interviewed based on the principles of constant comparison29 and data saturation.30 Interviews took 20–45?minutes and were audio recorded in private rooms at the Lookout Society’s shelters. Each interview began with the participant’s perspective on oral health and use of oral health care and continued to explore the relevant effects of mental health, substance use, residential history, competing needs and victimization connected with oral health care use, if applicable. Both past and current experiences using dental care were explored during the interviews. Participants each received $30 on completing the interview. This study was approved by the University of British Columbia’s Behavioural Research Ethics Board (#?H14-01169). We interviewed 25 homeless people (18 men; 7?women), aged 25–64 years. Of these participants, 8 identified themselves as Indigenous persons, 8?self-assessed as functionally disabled yet cognitively alert and 17 rated their oral health as poor or fair. Only 2 participants self-identified as suffering from mental health problems, but were on medication and were able to speak with the interviewer. Most participants had been living in parks or streets, but were currently in shelters or in an outreach program. Government-sponsored oral health programs refers to the limited publicly sponsored dental plans for low-income people in British Columbia, including the homeless. Participants commented that the current limit of $1000 biannually is insufficient to cover their many oral health care needs. 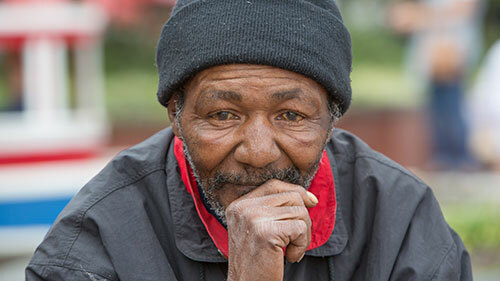 Homeless support was understood in general terms, from offering shelters to enabling recovery from drug use, addressing food security and advocating a healthier life-style. Participants believed that proper support would increase their knowledge about health and motivation to seek care. Oral health outreach initiatives refers mainly to volunteer programs augmenting existing government-sponsored dental plans to improve contact between dental professionals and homeless people. Such initiatives are believed to counteract the effects of poor oral health on comfort, eating, smiling and communicating. Professional education should sensitize dental professionals and reduce the stigma associated with homelessness. It should also enhance oral health care for people who are homeless, so that bad experiences with oral health care providers can be minimized or eliminated and worry and anxiety about visiting dentists decreased. Altogether, these 4 themes should contribute to better understanding of the behaviour and oral health care needs of homeless people and should be considered in decision-making on oral health care (Fig.1). 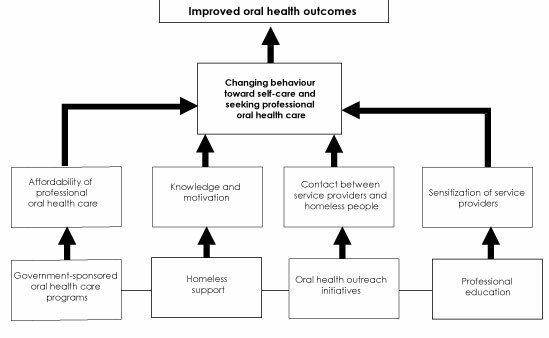 The aim of this study was to develop a model pathway to oral health care for homeless people, based on their perceptions and experiences with oral health-related services in Vancouver. The 25 informal interviews that we conducted with homeless people revealed 4 main themes: government-sponsored oral health programs, homeless support, oral health outreach initiatives and professional education. The model calls for interdisciplinary efforts by medical and dental professionals, social workers, nurses, advocates, volunteers and government agencies to mitigate barriers and enable homeless people to access dental care. Despite the differences in patterns of oral health care delivery across Canada, the model pathway presented in ?1 can be applied locally, nationally and beyond,31 as there is a perceived need for more equitable access to oral health care services regardless of where one lives. Models pathways have been proposed to explore the effect of an array of factors that influence the need and demand for health care and better patient outcomes.15 This study is the first to propose a model pathway for care aimed at mutual decision-making and organization of care processes for homeless people, similar to what Morhardt and colleagues27 proposed for dementia patients and Pruksapong and MacEntee32 advocated for improving the quality of oral health care in nursing homes. A model pathway to oral health care could enable dental teams to work proactively with homeless people toward optimal oral health. Figure?1 is empirically based and must be tested and evaluated further, both locally and with other homeless communities across Canada and elsewhere, and including a larger number of homeless participants. We did not perform clinical examinations or confirm self-reported health, because we were interested only in the perspectives and experiences of the participants. In addition, we cannot confirm that participants’ encounters with dentists were as described, as the focus of our inquiry was on self-perceived experiences. There are also potential challenges associated with each of the 4 proposed themes in the model pathway. Under government-sponsored programs, for example, there is an upfront need for a broad-based and universal commitment from governments to allocate additional money to dental health care, particularly for those with financial constraints. For homeless support services, there is a need to advocate a national affordable housing strategy for all. In terms of oral health outreach, the profession has to consider alternative yet efficient ways to deliver care that is not solely based on large profit margins. Under professional education, there is a need to think “outside the box” and, perhaps, consider bringing homeless people into classrooms, as teachers, to promote sensitivity and empathy. In summary, the model pathway proposes enabling factors to enhance the oral health of homeless people and ensure that they have positive experiences using oral health care. The model pathway is based on the suggestions and concerns of homeless participants regarding oral health care. The underlying factors affecting this issue are knowledge and motivation, visibility between service providers and recipients, financial access to oral health care, empathy in patient care and experiences in oral health care. These factors are similar to those Pegon-Machat and colleagues41 suggested as deficient and a cause of problems among poor people. This model depicts the enabling domain of Gelberg-Andersen’s behavioural model for vulnerable populations20 in greater detail by indicating how the 4 main factors affect subfactors that could change service use by homeless people. The oral health care model pathway presented here might help to determine the factors that would enable homeless people to access oral health care and be included in the decision-making process. It might also help dental teams foster care-seeking behaviour based on factors that are deemed relevant to this vulnerable population, so that oral health is promoted and maintained. The model pathway provides insight into promoting positive oral health outcomes for homeless people. Dr. Mago is project manager, community electronic medical record, Keewaytinook Okimakanak Tribal Council, Thunder Bay, ON. Dr. Brondani is associate professor and director, dental public health, faculty of dentistry, University of British Columbia, Vancouver, BC. Dr. MacEntee is professor emeritus, faculty of dentistry, University of British Columbia, Vancouver, BC. Dr. Frankish is endowed professor, school of population and public health, University of British Columbia, Vancouver, BC. We thank the homeless adults who participated in this study. We also offer our sincere gratitude to the staff at the Lookout Emergency Aid Society for its support of this study. Gaetz S, Barr?C, Friesen?A, Harris?B, Pauly B, Pearce B, Turner A, Marsolais A. Canadian definition of homelessness [accessed 2018 Nov 12]. Toronto: Canadian Observatory on Homelessness; 2012. Available from: tỷ lệ kèo bóng đáhttp://www.homelesshub.ca/CHRNhomelessdefinition/. Hajizadeh M, Mitnitski A, Rockwood?K. Socioeconomic gradient in health in Canada: is the gap widening or narrowing? Health Policy. 2016;120(9):1040-50. Frankish CJ, Hwang SW, Quantz D. Homelessness and health in Canada: research lessons and priorities. Can J Public Health. 2005;96(Suppl?2):S23-9. Shelton KH, Taylor PJ, Bonner?A, van den?Bree?M. Risk factors for homelessness: evidence from a population-based study. Psychiatr Serv. 2009;60(4):465-72. Jenkins M. An assessment of homeless families’ diet and nutrition. Community Pract. 2014;87(4):24-7. Gibson G, Rosenheck R, Tullner JB, Grimes?RM, Seibyl?CL, Rivera-Torres?A, et?al. A national survey of the oral health status of homeless veterans. J?Public Health Dent. 2003;63(1):30-7. Hau KPH. Characterizing the oral health of low-income adults in Vancouver’s Downtown Eastside. MSc thesis. Vancouver: University of British Columbia; 2014. Bedos C, Brodeur JM, Boucheron L, Richard?L, Benigeri?M, Olivier?M, et?al. The dental care pathway of welfare recipients in Quebec. Soc Sci Med. 2003;57(11):2089-99. Wallace BB, MacEntee?MI. Access to dental care for low-income adults: perceptions of affordability, availability and acceptability. J?Community Health. 2012;37(1):32-9. Wallace BB, MacEntee MI, Pauly?B. Community dental clinics in British Columbia, Canada: examining the potential as health equity interventions. Health Soc Care Community. 2015;23(4):371-9. Smith MY, Rapkin BD, Winkel G, Springer?C, Chhabra?R, Feldman?IS. Housing status and health care service utilization among low-income persons with HIV/AIDS. J?Gen Intern Med. 2000;15(10):731-8. Caton S, Greenhalgh F, Goodacre?L. Evaluation of a community dental service for homeless and “hard to reach” people. Br Dent?J. 2016;220(2):67-70. Armfield JM, Heaton LJ. Management of fear and anxiety in the dental clinic: a review. Aust Dent?J. 2013;58(4):390-407. Mago A, MacEntee?MI, Brondani?M, Frankish?J. Anxiety and anger of homeless people coping with dental care. Community Dent Oral Epidemiol. 2018;46(3):225-30. Gelberg L, Andersen RM, Leake?BD. The behavioral model for vulnerable populations: application to medical care use and outcomes for homeless people. Health Serv Res. 2000;34(6):1273-302. Brondani MA, Alan R, Donnelly?L. Stigma of addiction and mental illness in health care: the case of patients’ experiences in dental settings. PLoS One. 2017;12(5):e0177388. Pegon-Machat E, Tubert-Jeannin?S, Loignon?C, Landry?A, Bedos?C. Dentists’ experience with low-income patients benefiting from a public insurance program. Eur J Oral Sci. 2009;117(4):398-406. Laslett AM, Dietze P, Dwyer?R. The oral health of street-recruited injecting drug users: prevalence and correlates of problems. Addiction. 2008;103(11):1821-5. Feldman J, Middleman AB. Homeless adolescents: common clinical concerns. Semin Pediatr Infect Dis. 2003;14(1):6-11. Schrijvers G, van Hoorn A, Huiskes?N. The care pathway: concepts and theories: an introduction. Int J Integr Care. 2012;12(Spec Ed Integrated Care Pathways):e192. Morhardt D, Weintraub S, Khayum?B, Robinson?J, Medina?J, O’Hara?M, et?al. The CARE pathway model for dementia: psychosocial and rehabilitative strategies for care in young-onset dementias. Psychiatr Clin North Am. 2015;38(2):333-52. Vanhaecht, K, De Witte, K., Sermeus, W. The Care Process Organisation Triangle: A framework to better understand how clinical pathways work. J Integrat Care Pathways. 2007;11:1-8. Fram SM. The constant comparative analysis method outside of grounded theory. Qual Rep. 2013;18(1):1-25. Available: http://www.nova.edu/ssss/QR/QR18/fram1.pdf. Dental services coverage [accessed 2017 May 11]. Québec: Régie de l’assurance maladie du Québec; 2017. Available: http://www.ramq.gouv.qc.ca/SiteCollectionDocuments/citoyens/en/depliants/depl-services-dentaires-en.pdf. Pruksapong M, MacEntee MI. Quality of oral health services in residential care: towards an evaluation framework. Gerodontology. 2007;24(4):224-30. Brondani MA, Phillips JC, Kerston?RP. Stigma around HIV in dental care: patients’ experiences. J?Can Dent Assoc. 2016;82:g1. Salmasi A, Harrison R, Brondani?MA. They stole her teeth! An exploration of adults with developmental disability experiences with dental care. Spec Care Dentist. 2015;35(5):221-8. Brondani MA, Clark C, Rossoff?L, Aleksejuniene?J. An evolving community-based dental course on professionalism and community service. J?Dent Educ. 2008;72(10):1160-8. Brondani MA, Pattanaporn K, Aleksejuniene?J. How can dental public health competencies be addressed at the undergraduate level? J?Public Health Dent. 2015;75(1):49-57. Withy KM, Amoa F, Andaya JM, Inada?M, Berry?SP. Health care needs of the homeless of O’ahu. Hawaii Med?J. 2008;67(8):213-7. Okuyemi KS, Goldade K, Whembolua?GL, Thomas?JL, Eischen?S, Sewali?B, et?al. Motivational interviewing to enhance nicotine patch treatment for smoking cessation among homeless smokers: a?randomized controlled trial. Addiction. 2013;108(6):1136-44. Parker EJ, Jamieson LM, Steffens?MA, Cathro?P, Logan?RM. Self-reported oral health of a metropolitan homeless population in Australia: comparisons with population-level data. Aust Dent?J. 2011;56(3):272-7. Schanzer B, Dominguez?B, Shrout?PE, Caton?CL. Homelessness, health status, and health care use. Am J Public Health. 2007;97(3):464-9.